Is the future of fleet management in smartphones? While autonomous vehicles and platooning have been making headlines, smartphones and their potential to enable digital disruption in the trucking industry have not received much-deserved attention. To fully grasp just how much change is occurring in the road freight industry due to the use of smartphones it is useful to look at the findings of the global consulting firm Frost & Sullivan on the use of mobile technology in the road freight sector. According to Frost & Sullivan mobile-based freight matching will be the biggest disrupter transforming the North American transportation industry. Two other app segments, fleet optimisation and driver utility apps also hold enormous potential. Fleet optimisation apps have the potential to drastically reduce cost barriers to adopt services that were previously only accessible through traditional telematics units requiring hardware. Due to the high costs, telematics systems are not yet a common feature in the road freight industry. In particular for smaller operators the cost of the equipment outweighs the benefits relative to their fleet size. And this is where the potential of smartphones to bring about significant operational efficiencies is the greatest. While smartphone apps are not a replacement for telematics, the low cost coupled with the myriad of uses makes them a very powerful fleet management tool for the smaller operators. In addition to providing truck drivers with information for things like locations and routes, smartphones can also deliver valuable feedback and fleet data to managers. Due to this rising smartphone trend, developers are now designing apps with fleet vehicle management specifically in mind. Therefore, whether a road freight operator is interested in maintenance costs, risk management, mileage reporting, vehicle tracking, hours worked or fuel emissions, smartphones and their apps seemingly have the answer. The U.S. trucking company, Ryder, for instance, developed a new app for its drivers which compares real-time fuel rates to conveniently schedule shop services and schedules vehicle maintenance appointments. Many fuel card providers offer fuel pricing applications for smartphones that will guide drivers to the lowest pump price. Moreover, according to some industry commentators, we are likely to see smartphone payments become a viable long-term alternative or addition to existing fuel cards. With more and more developers designing fleet specific apps, the potential applications to the road freight sector will also increase. 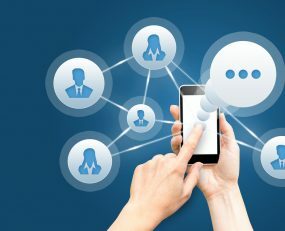 To sum up, in the trucking industry, staying connected is vital in order to track deliveries, update schedules and stay in touch with drivers. Being the lower cost alternative to telematics, smartphones are therefore one of the most vital tools to make fleet management easier and more efficient among smaller road freight companies.